This advertisement ran in the January, 1960 issue of Pacific Poultryman. I have been using my own Aquamagic Model 60 egg cleaner since 1997. It’s a model very similar to the one shown above, though with a fancier candler. These water-spray-plus-brush cleaners are great. I’ve used two different kinds of immersion washers, and they don’t get the eggs very clean, and of course the eggs are still wet after washing. 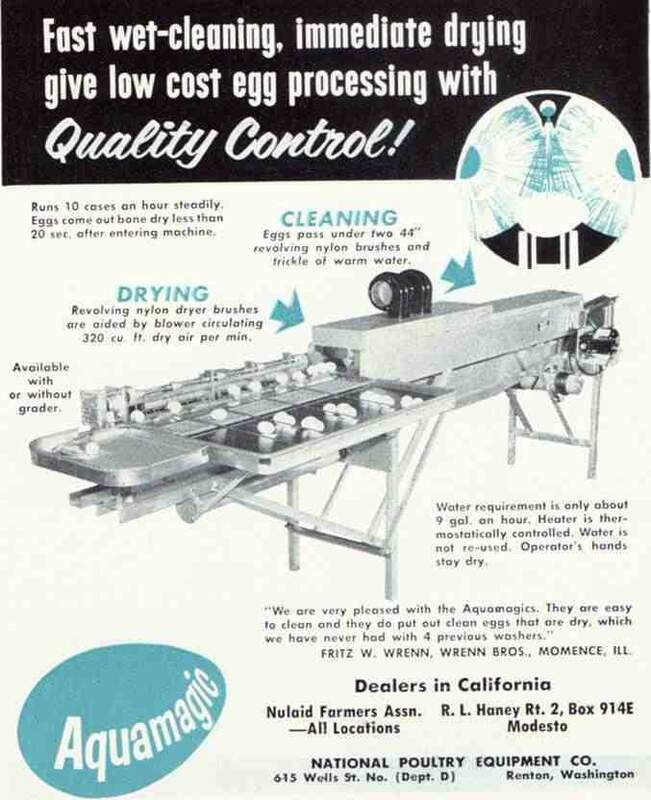 By combining candling, washing, drying, and grading into a single machine, the Aquamagic makes egg processing fast and convenient. Over the years, there are different models of different speeds and sizes, and with different options. Some don’t have the egg grader, for instance. Mine, like the one shown in the ad at the top of the page, is something like sixteen feet long. There are also smaller models that fit in less space, run more slowly but have all the features. With two people, we run ours at about one-third of its rated speed, but the candler section is broken and we’re candling by hand. Apparently two people with a fully loaded machine can run it at about 75% of its rated speed (or 225-325 dozen per hour) without too much trouble. How Do I Get an Aquamagic/Sani-Touch Egg Washer? These machines are still being made by the National Poultry Equipment Company, so you can buy one new. (They’ve changed the name from “Aquamagic” to “Sani-Touch,” but they are fundamentally the same machines. And since these egg washers have been in production for over 50 years, and are extremely rugged, you can also find them used from time to time. Sometimes they’ve been sitting in a barn for so long that the owner has no idea what the machine is, so keep your eyes open for a bargain! An Aquamagic in poor shape can be quite a restoration project, so you might want to do your homework about replacement part prices, etc. before making an offer on one that’s in sad shape. Parts are still available for almost everything, and the folks at National Poultry Equipment provide seemingly unlimited phone support. Pretty neat stuff – thanks! Dumb question – when it comes to candling is there an operator there to intervene if a bummer egg comes through or does the machine handle that? Halsey? That doesn’t ring a bell, but there used to be a lot of egg farms in the Willamette Valley, and I have a fair grasp only of the ones right around Corvallis. Re candling, the person loading the machine does the candling as well, if you’re not going for super-high-speed operation, because plucking cracked eggs off the candler slows you down. For more speed, just add more people, maybe a lot more. You can run an Aquamagic with just one person, but you have to run back and forth a lot. A second person makes a world of difference. Four might be ideal. I have a reconditioned Sani-touch machine for sale if interested. Leave a comment I will be notified.